​During the initial entradas by Spanish conquistadores along the mainland coast of Mesoamerica, Spanish forces infrequently encountered strong military resistance from indigenous populations. One prominent exception to this rule was the early expedition led by the conquistador Francisco Hernández de Córdoba in 1517. Sailing from Cuba, this ill-fated entrada explored the northern and western coasts of the Yucatán Peninsula before making at stop at the mouth of the Río Champotón to collect drinking water. During their stopover the Spaniards encountered fierce opposition from local warriors led by the Moch Couoh, cacique of the Maya polity of Chanpeten/Chakanputun. During this confrontation, the Spanish suffered heavy losses, leading to the cancellation of the expedition and the eventual death of Córdoba himself. Following this conflict, Champotón was referred to as the Báhia de la Mala Pelea (“Bay of the Bad Fight”). Ethnohistoric sources provide a wealth of information about the ancient port city of Champotón due to it's location and unique local history. Unlike most Contact Period population centers in the humid lowlands of the Gulf Coast – many of which were depopulated due to a combination of epidemic diseases and oppression – Champotón remained an important settlement through the upheavals of the Spanish Conquest. While continuous occupation has had a major impact on the architecture and layout of the pre-Hispanic urban center, this unique history has resulted in a rich corpus of ethnohistoric accounts about the urban center, economy, and regional political landscape at the moment of contact. The regional state of Champotón/Chakanputun encompassed the area from Seybaplaya to the north to the province of Tixchel, located on edge of the Laguna de Terminos in the south. The seat of the regional state was located at the mouth of the Río Champotón. 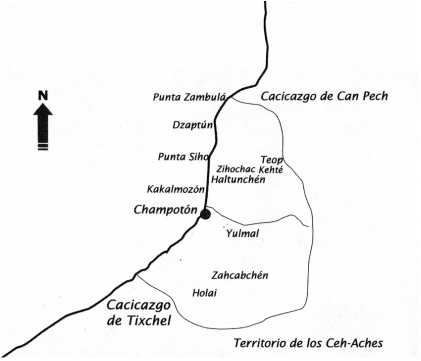 The major secondary centers in the Champotón polity included Yulumal (Ulumal), Haltunchén, Zihochac (Sihochac), Dzaptún (Seybaplaya), Zahcabchen (Dzacabuchen), and Holail Most of these places were incorporated into the Encomienda of Champotón in the colonial period and later the Municipio of Champotón. The most detailed accounts about the form and layout of the city were from the second Spanish expedition into Champotón led to Francisco de Montejo in 1530. Sources from this entrada described the city as a large port center with over 8,000 houses. As a point of reference, the same author reported smaller populations for several important Contact Period centers, including five thousand houses at the town of Conil, two thousand at Chetumal, and less than one thousand at Acalan. ….dentro de la mar, a tres tiros de ballesta o un cuarto de legua, está un islote hecho a mano en que hay 10 ó 12 gradas de alto, sobre la superficie del agua, y sobre alla una torre bien alta de piedra y muy bien labrada; estaba llena de ídolos y allí honraban y celebraban a su dios de la pesquería; en aquella torre tenían muchas cabezas secas de grandes pescado colgados. ….within the sea, at three shots of a crossbow or a quarter of a league, there is a man-made island that is 10 to 12 grades in eight above the surface of the water, and above that a very high tower built of stone and very well built; it was full of idols, and there they honored and celebrated their god of fishing; in that tower they were hung many dried heads of large fish. The Champotón regional state at Spanish contact. From Arnabar Gunam (2003), adpated from Molis Solis (1943). 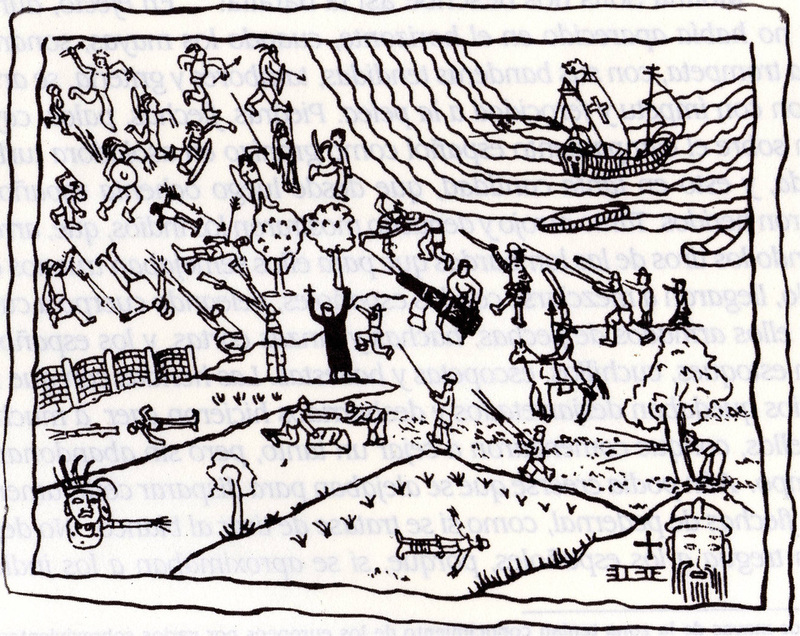 Spanish depiction of the battle of the Báhia de la Mala Pelea (“Bay of the Bad Fight”). Original source unknown, reproduced from Arnabar 2005:52. Artist’s representation Contact Era Champotón, with the oft-cited offshore temple. The causeway connecting the temple to the shore has not been identified archaeologically. Unknown artist, adapted from Arnabar 2005:30. ​Landa (Tozzer 1941:26, note 140) also mentions a similar temple dedicated to the deity Kukulkan, erected in honor of his passing through Champotón. The remains of this structure are still visible on a small island located offshore from the mouth of the river. Spanish accounts of Champotón describe a substantial urban capital. Based on normal methods for population estimates, the accounts of Dávila and Las Casas would indicate a population of 40,320 people. This population estimate is entirely dependent on the accuracy of the figure of 8,000 houses. However, the latter figure would be somewhat consistent with Dávila’s account in which 15,000 people that purportedly came meet the second group of Spanish conquistadors as they approached the city. One major problem with this estimate is the potential for exaggeration of the size of Champotón, especially given the earlier defeat suffered by the Hernández de Córdoba expedition. This estimate follows typical standards of population reconstruction used in the Maya Lowlands, based on the assumption of an average family size of 5.6 individuals (Redfield and Villa Rojas, 1934) and a accounting for 90% occupation of extant residential structures. This method produces a relatively conservative estimate of population, and represents middle ground in different approaches to population estimates from archaeological settlement survey data.